Messy or sauce on the side with your choice of sauce or our special dressing. Lettuce, tomato, pickles, our chipotle mayo and your favorite signature sauce. 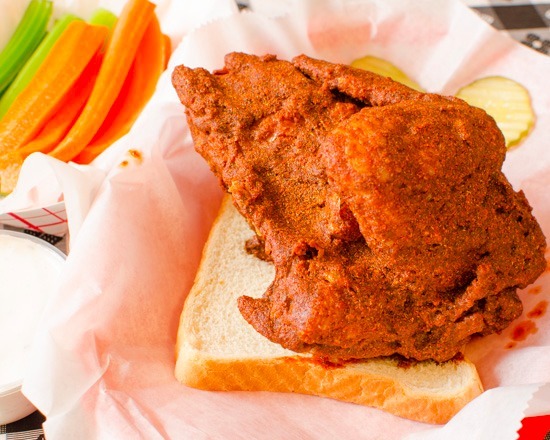 One Fried Tender, Lettuce, Tomato, Pickle, Cheese and our signature Honey Sriracha sauce. Enjoy the great taste of breaded nuggets with your choice of ranch, bleu cheese, or one of our signature sauces. Available in TN Hot or Mild, or sauce of your choice. Three Quarter to One Pound chicken breast with wing. Yellow Corn mixed with Fresh Red Onion and Bell Pepper, blended with creamy mayo and shredded cheese. Served with a crunchy topping! Smokey and mild with a slight kick. You won’t call this hot, but the combination of tangy Chipotle pepper with the smokey twist will have you craving more. Classic Buffalo style sauce. Made with Habanero peppers. We have captured the true “BUFFALO” taste. For those who love that great Buffalo flavor, but a little less burn. Only for those who can handle the hottest of sauces. Our TNT will live with you long after you finish. Major afterburn. Great traditional barbeque flavor. Tangy and bold. Excellent sauce for that outdoor barbeque taste. Made with real Kentucky Bourbon. Sweet and Bold, a delicious blend that our customers have crowned the sauce of choice for people who don’t eat hot sauces. 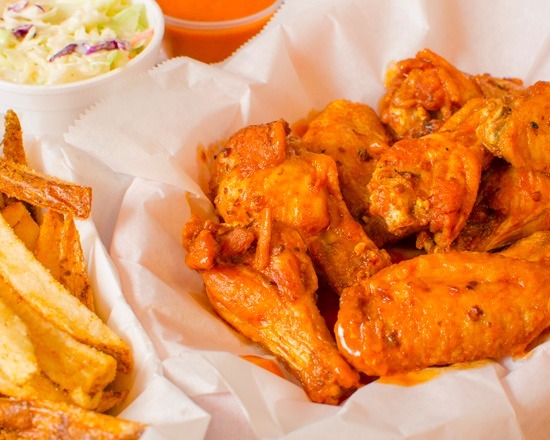 Tasty garlic sauce that coats the wings with just the right blend of flavor. Then we cover the wings with parmesan cheese. WOW – what a treat. Here is a combination that is hard to beat. Tangy lemon, with spicy pepper and salt. True delight to enhance the great taste of our chicken. This blend of spicy mustard and sweet honey, along with our secret spices make this the perfect honey mustard. There is honey mustard, then there is WingBasket honey mustard. This sauce begins with the sweetness of our Kentucky Bourbon, then blends in just the right amount of heat to become a flavor sensation you won't soon forget. Wet sauce with a buttery tomato sauce base, blended with a great Cajun Seasoning mixture for just the right amount of kick without a burn. Traditional flavor blended with spicy gold sauce and honey. 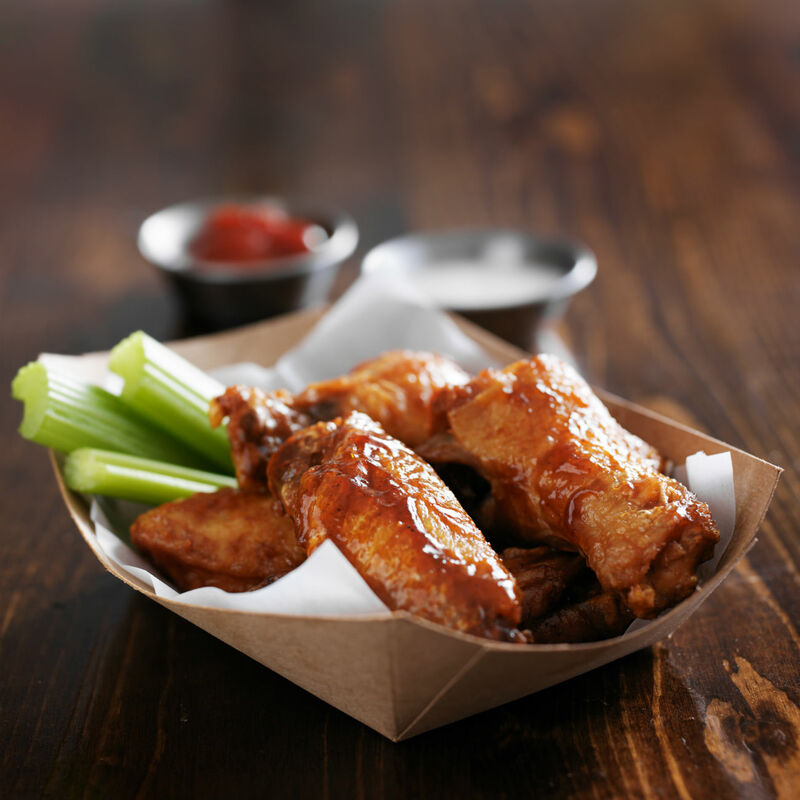 Order any quantity of fresh wings and pay only 79 cents per wing. Cover these wings with your choice of great sauces. Boneless wings are also available at the 79 cent price as well. Get our great chicken tenders, so large you won't believe your eyes. Happy Hump Day. The weekend is almost here. Celebrate with our easiest-to-eat wings for a price that will leave you wanting more. Treat yourself to the perfect side order. Made from fresh potatoes, seasoned to perfection. Quick and Tasty! Available in Hot or Mild. Three quarter to one pound chicken breast with wing. 35 wings, two large sides (your choice of Fries, Coleslaw, or Picnic Pasta), and three 16 oz drinks. One fried tender, lettuce, tomato, pickles, cheese and our signature honey sriracha sauce with regular fries and a 16 oz drink. 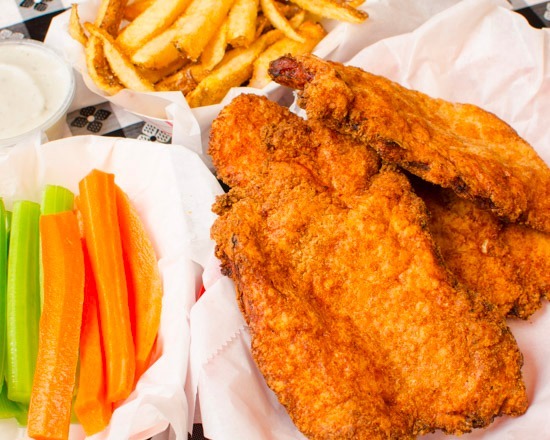 Three quarter to one pound chicken breast with wing, with regular fry and 16 oz drink. Your choice of seasoning or wing sauce.